Carolee Bennett is an artist and poet living in Upstate New York, where she likes to say she has been the “almost” poet laureate of Smitty’s Tavern (placing as first runner-up in an annual contest). Her poems have been published in a number of print and online journals, and in 2015 her poem “On not shielding young minds from the dark” placed as a semi-finalist for the Tupelo Quarterly Poetry Prize. 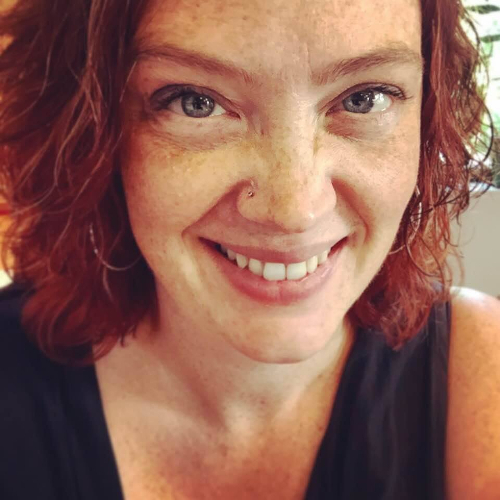 She has an MFA in creative writing (poetry) from Ashland University in Ohio and works full-time at a marketing agency as a writer / content manager. runs off with the malignancy flopping in his jaws. but we’re all more hopeful than we used to be. (save someone before it’s too late). we pull cars aside to make way. but the family will say someone tried. jumps up, pounds on the body. calls us broken, calls us irretrievable. The us: irretrievable. The we: irretrievable. who’ll do anything to bring us back.